For DC buses, see also DC Bus - Base Voltage Specifications. For buses, the program automatically assigns the names BUS-1, BUS-2, BUS-3, and so on. Base kV for the bus. Note that the bus must have a kV entered before equipment can be connected to the bus. Anything less than 1 kV is considered low voltage, anything 1 kV or more is high voltage. MCCs and panel schedules can only be connected to low voltage buses. Lock Auto Sizing When this check box is selected, this item cannot be automatically sized using SmartDesign™ (the auto-design feature). The minimum amp rating of equipment that is upstream from the bus (such as breakers, transformers, or cables). This information is for reference in certain specific configurations of EasyPower and is not generally visible. Switchgear: This can be low voltage or high voltage switchgear. Open Air: The bus has no enclosures. Conductor: Wire ways, bus ways, and so on. Panel: Small and lighting panels. Panelboard: Low voltage power panelboards. Switchboard: This can be a low voltage or high voltage switchboard. NEMA E2 Contactor: NEMA E2 motor starter enclosures. The power voltage is at medium voltage. For low voltage control circuits this type can be used. Int Switch: Interrupting or disconnect or safety switch. VFD: Variable frequency drive or some type of motor drive. ATS: Auto or manual transfer switch. Transformer Terminal: Enclosure transformer terminals/bushings. Vault: Underground space such as manhole for cable connections, transformers, and so on. Padmount Equipment: Padmount switches, padmount transformers cabinets, and so on. Control Panel: Enclosure for control circuits. Junction Box – Large: Large or deep junction box. Junction Box – Small: Small or shallow junction box. Network Protector: Spot or grid network protectors used in network distribution systems. Other: Any other type not specified. Mfr The manufacturer of the bus. User-defined, up to 15 characters. Type The type of bus rating. User-defined, up to 15 characters. Rating (A) Continuous current rating of the bus in amperes. A high voltage bus can have asymmetrical kA or peak kA (crest) units. A low voltage bus has symmetrical kA units. Material The material with which the bus is made. The options include copper, aluminum, or other. Mounting The method by which the bus is mounted. Options include flush, surface, or free standing. One-line Graphics – Line Style The box drawn around the bus symbol in the one-line. Any line style can be selected from the box to represent an enclosure such as switchgear. When this option is selected, a rectangular pad symbol is displayed below the bus on the one-line. 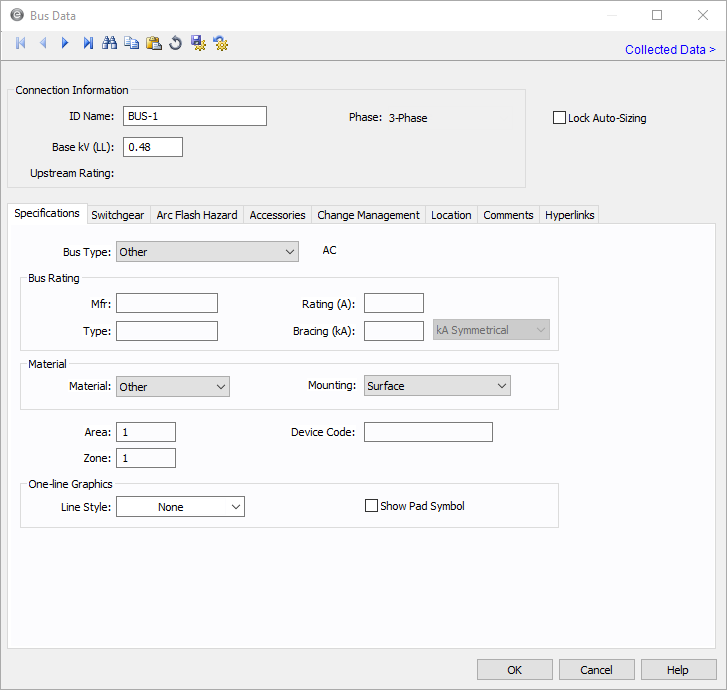 This tab allows you to calculate downstream loads on all the branches breakers connected to the bus. This tab can be labeled as Switchgear, or Panelboard, or Switchboard depending on the Bus Type selected in the Specifications tab. Enable Switchgear Spreadsheet Selecting this check box enables you to modify information, enter load data and calculate downstream loads. Once you make the necessary data entry and calculations you can you can clear the check box to prevent changes. When the check box is not selected, the data can still be read, but not changed. Calculate Downstream Load Clicking this button calculates all downstream loads for each breaker, fuse, or branch connected to this bus. All branches are considered downstream unless there exists a source such as a UPS, generator or utility in the direction of the branch. The program traverses through all the paths and determines whether or not there is a power source in the path. All loads are summed and reported in the spreadsheet if there is no power source in the path. For the bus types ATS, switchgear, switchboard, panelboard, panel and MCC, you can fault buses and store the short circuit current and arc flash results in the database. These results can be displayed in schedules for switchgear, switchboard, panelboard, panels and MCCs. The stored results can also be viewed in the database browser and report. See Storing Short Circuit and Arc Flash Results for more information. 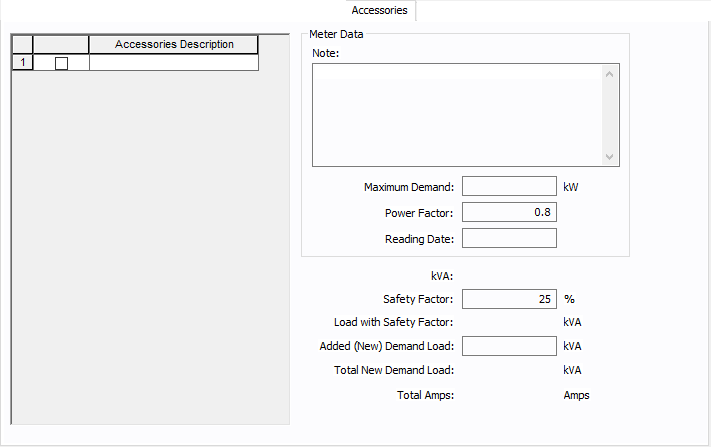 Unit You can display downstream loads in kVA or Amps. Elevation You can choose the elevation layout of the switchgear such that protective devices in stacked in columns or rows. For columns, the breakers in one unit are stacked vertically. For rows, you can have a single breaker, or breakers on the left or right. See Elevation View for more information. Diversity Enter the diversity factor for the bus. The factor is used in calculating connected, demand, code, and design kVA. The diversity factor is the ratio of the sum of the maximum demands of the individual loads to the maximum demand of the entire system, including all of those loads. Enter a value between 1 and 10. ID Name ID name of the equipment connected to the bus. If any branch has a protective device such as a switch, fuse or breaker connected to the bus, then the ID name of the protective device is shown. Otherwise the branch ID name is shown. Section Space Text that describes the space for the protective device or branch. Description Text that describes the branch connected to this bus. Device You can specify the protective device or branch as Feeder, Main, or Tie. This is for information only and does not affect calculations. The number shown is the diversity factor of the downstream bus with an equipment type of Switchgear, Switchboard, or Panelboard. If another equipment type is selected, the diversity factor is set to 1. Diversity factor is used in calculating the connected, demand, code and design kVA. The diversity factor is the ratio of the sum of the maximum demands of the individual loads to the maximum demand of the entire system, include all of those loads. 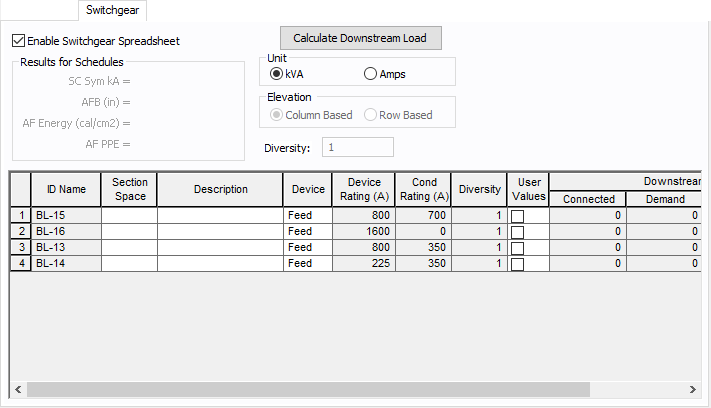 Click Calculate Downstream Load to update the diversity factor. Device Rating (A) Continuous current rating of the protective devices in amps. Cond Rating (A) Amp rating of branch conductors. User Values Select the check box to manually enter a load. When checked, the entered values are used and the calculated downstream values from the one-line are ignored. For information on this tab, see Elevation View. The Arc Flash Hazard tab enables you to specify the necessary details of the equipment for arc-flash hazard calculations. Note: This information is used in certain specific configurations of EasyPower and is not generally visible. See Buses and Panels in Change Management Help for details.